Asian/Pacific Islander American Women is the first collection devoted to the historical study of A/PI women's diverse experiences in America. 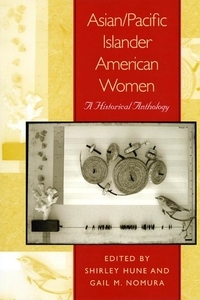 Covering a broad terrain from pre-large scale Asian emigration and Hawaii in its pre-Western contact period to the continental United States, the Philippines, and Guam at the end of the twentieth century, the text views women as historical subjects actively negotiating complex hierarchies of power. The volume presents new findings about a range of groups, including recent immigrants to the U.S. and understudied communities. Comprised of original new work, it includes chapters on women who are Cambodian, Chamorro, Chinese, Filipino, Hmong, Japanese, Korean, Native Hawaiian, South Asian, and Vietnamese Americans. It addresses a wide range of women's experiences-as immigrants, military brides, refugees, American born, lesbians, workers, mothers, beauty contestants, and community activists. There are also pieces on historiography and methodology, and bibliographic and video documentary resources. This groundbreaking anthology is an important addition to the scholarship in Asian/Pacific American studies, ethnic studies, American studies, women's studies, and U.S. history, and is a valuable resource for scholars and students. Contributors: Xiaolan Bao, Sucheng Chan, Catherine Ceniza Choy, Vivian Loyola Dames, Jennifer Gee, Madhulika S. Khandelwal, Lili M. Kim, Nancy In Kyung Kim, Erika Lee, Shirley Jennifer Lim, Valerie Matsumoto, Sucheta Mazumdar, Davianna Pomaika'i McGregor, Trinity A. Ordona, Rhacel Salazar Parreñas, Amy Ku'uleialoha Stillman, Charlene Tung, Kathleen Uno, Linda Trinh Võ, Judy Tzu-Chun Wu, Ji-Yeon Yuh, and Judy Yung.